The time has finally come, boys and girls, so mark your calendars. 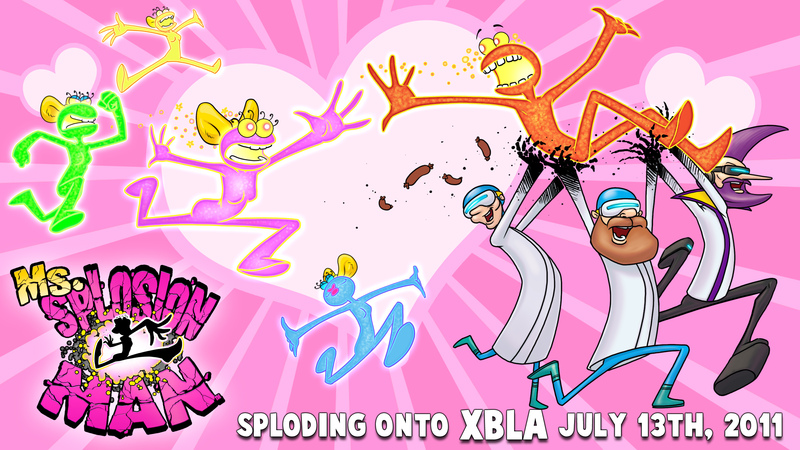 Ms. Splosion Man, the follow-up to the XBLA favorite Splosion Man, has got a release date. The full press release is below, so feast your eyes. Among other things, it touts completely revamped network support, something that had given us BrainLazers some trouble the first time around, and fifty levels for both single player AND multiplayer. July 13th can’t come soon enough. Four ladies after him? Wow. Splosion Man must be one hell of a guy. splodes her way onto the Xbox LIVE® Arcade marketplace. a complete behind-the-scenes look at the game’s creation. “We are incredibly proud of Ms.
summer on XBLA,” says Twisted Pixel CEO, Mike Wilford.